Peas are one of the oldest food crops grown in the world, according to the University of Arkansas. These versatile vegetables can be canned or eaten fresh, cooked or dried and eaten as a snack. Most peas grown in the home garden are cultivars of the English pea (Pisum sativum), which is often simply called the "garden" or "common" pea. Experts have not been able to determine the exact origin of the pea plant, according to the University of Arkansas, but experts agree that it probably originated in central Asia. Peas were not eaten fresh, but rather were dried so they would store longer. Over time, peas were cultivated so that they became sweeter and starchier, and people began to eat them fresh. These advances are credited in part to Gregor Mendel, an Austrian mathematician and monk. Mendel performed a series of experiments on pea plants that not only improved the genus, but illustrated how plant breeding can pass along the most positive traits in a plant. There are three main types of pea plants, according to the University of Illinois. English or garden peas are the most commonly grown and have wrinkled or smooth seed pods. The wrinkled varieties are considered the sweetest and are the most desirable in home gardens. Smooth seeded pea plants are often used to make soup or to dry to be eaten as a snack or garnish. Snap peas are the second. These peas have edible pea pods and are high in fiber content. Snow peas are grown mainly for the sweet, soft pods and are usually harvested before the peas develop. The specifics of the appearances of pea plants will vary depending on the species and cultivar. In general, the vining types grow to about 6 feet tall, while the other types average around 3 or 4 feet. They have compound leaves that are greenish-gray in color. Some have foliage and pods that are covered with fine hairs. Pea plants flower in early spring with fragile-looking, creamy white flowers. Peas need to be planted as soon as the soil can be worked and when it is still cool; around 45 degrees F, according to the University of Arkansas. They thrive in rich, loamy soil in a location where they will receive at least a half-day's worth of sunlight. Most types of pea plants will require some support to prevent the pods, which can reach up to 6 inches in length, from dragging on the ground. 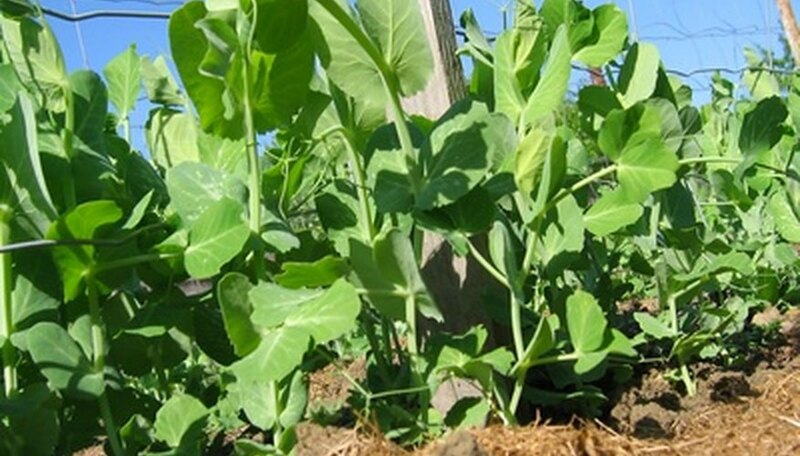 Pea plants can suffer from diseases and insect pests, according to Ohio State University. Rotate the peas so that they aren't planted in the same soil for more than three years. Diseases such as mosaic virus, wilt and root rot can build up in the soil, especially if it is overly wet due to standing water. Aphids, leafhoppers, mites and other common garden insects can also infest pea plants. These can often be knocked off the plants with a strong stream of water. What Are the Characteristics of a Pea Plant? What Is the Meaning of the Sweet Pea Flower?